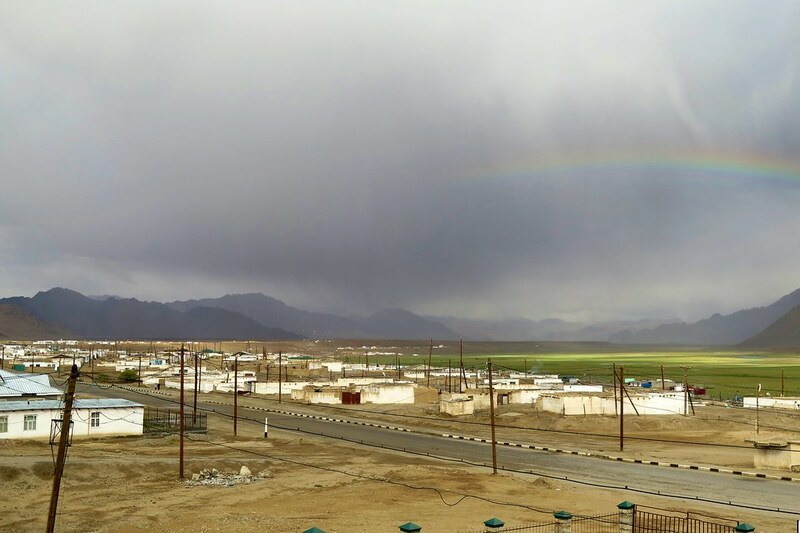 There isn’t a whole lot to do in Murghab, but we re-stocked our food supplies at the bazaar and had a couple of decent meals. 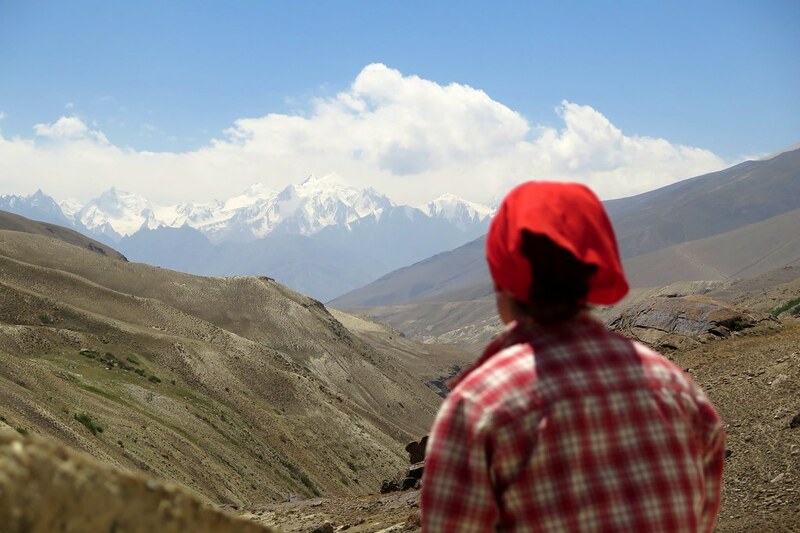 The Pamir Hotel is a strange place. 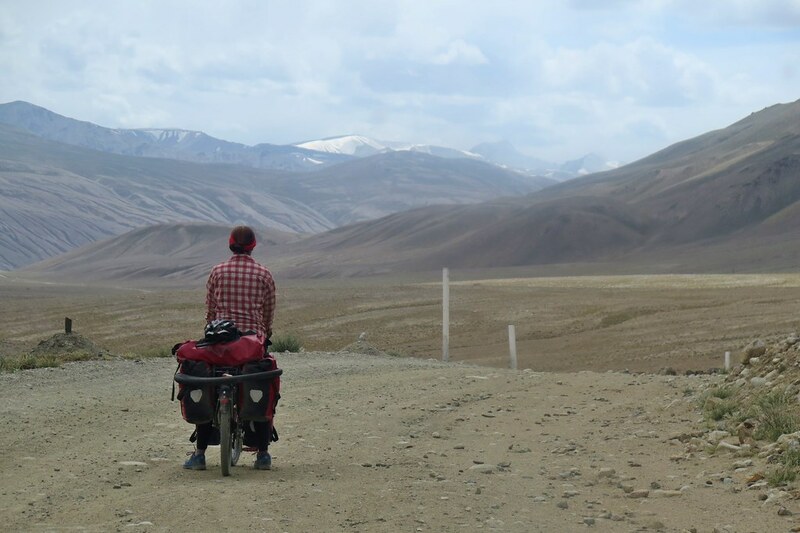 After a week of isolation, suddenly we were surrounded by European tourists arriving by 4×4, motorbike or bicycle. 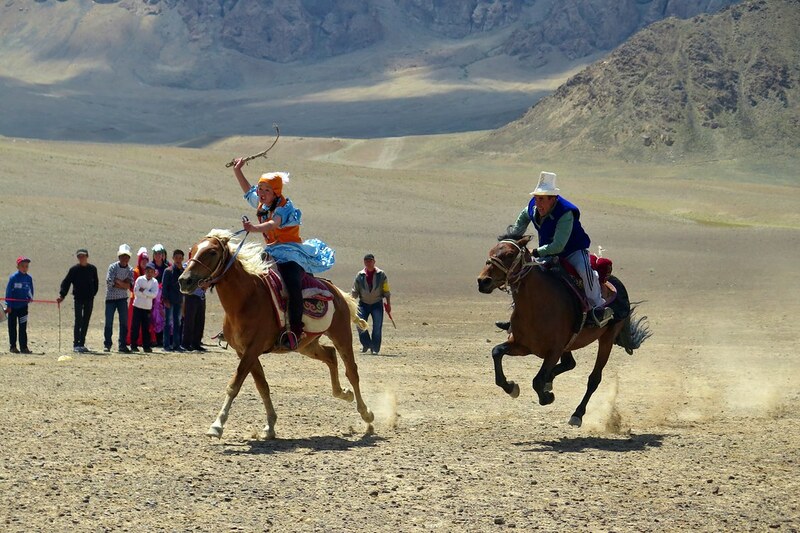 It was especially busy as Murghab was hosting an annual horse festival that weekend. We went down to check it out as we were leaving. We ran into Kim the Korean cyclist, as well as Frenchies, Tim and Claire who were shooting video for their documentary. Being animal lovers (and vets) the festival was right up their street, but we were happy just to watch a couple of rounds of a horseback ‘kiss chase’ type game before hitting the road. And just as we did, we ticked over 13,000km. Leaving Murghab we went through a military checkpoint. 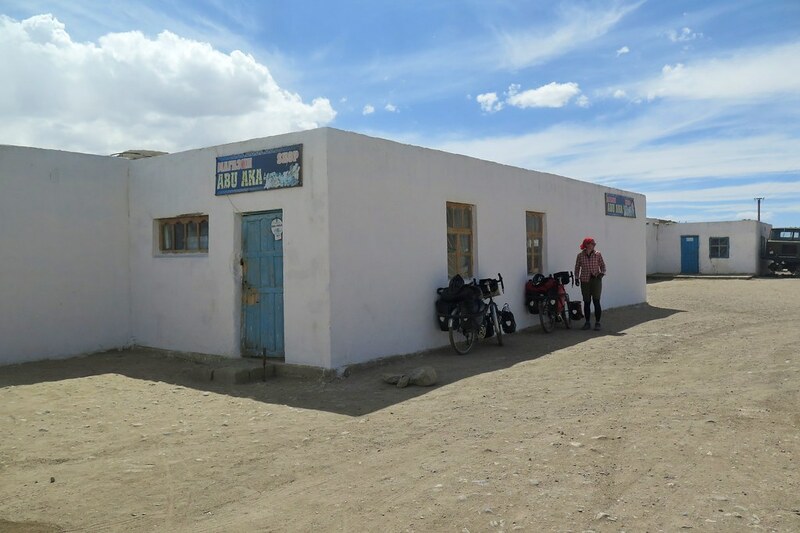 This GBAO area is divided into a number of different districts, each of which require a permit to travel through, which has meant regular passport and visa checks along the road. 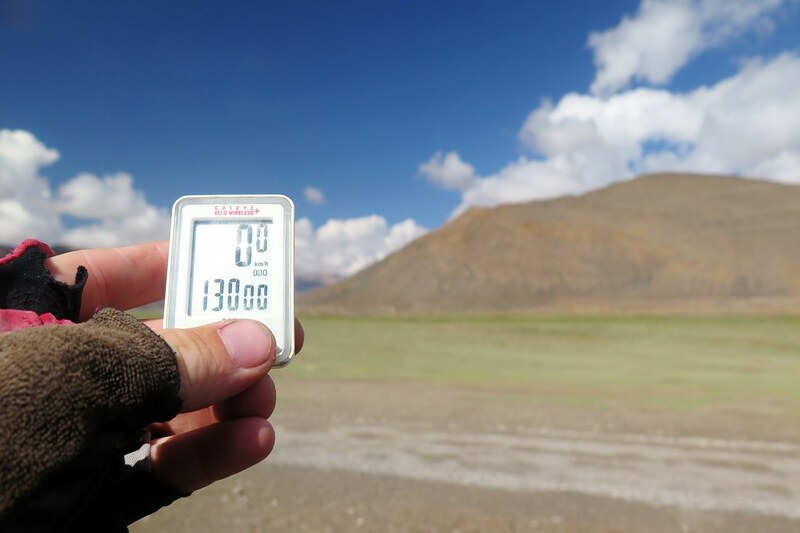 We had another 4,200 metre pass ahead of us, so the afternoon was a gentle climb up from Murghab which is at 3,500. The road surface was still good so it was a fairly casual afternoon’s riding through yet more empty wild scenery before we stopped for the evening just before the pass. We’d hoped to see some shooting stars that night as it was the middle of the Perseids meteor shower, but when we looked out from the tent in the small hours, the moon was so bright that not many stars were visible. The final section of the pass took us about an hour the next morning. We had a mellow descent from there down into the next wide valley with more big peaks in the distance. 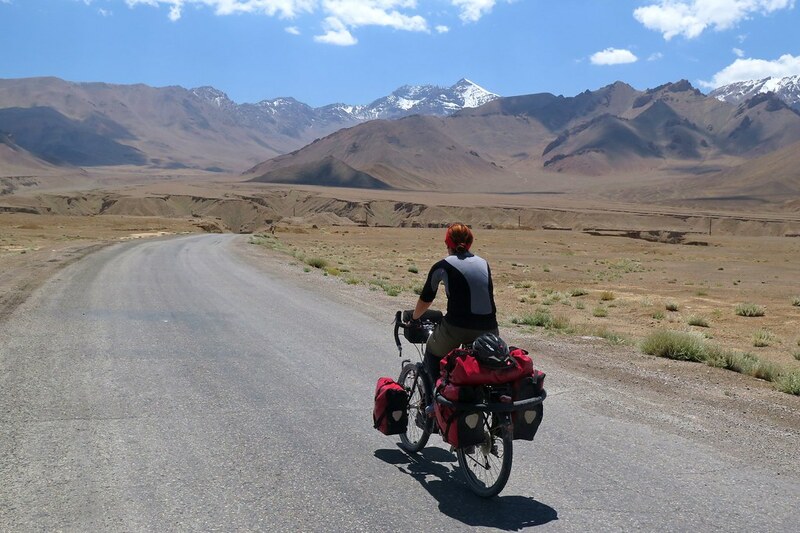 We met quite a few cyclists coming the other way, some who’d come from the Wakhan Valley, others who’d taken the ‘main’ road, the M41. 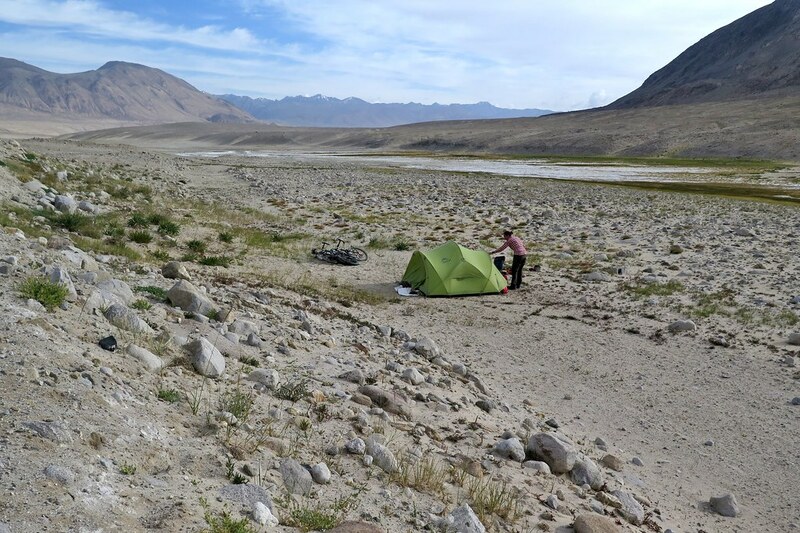 We’d more or less made up our mind at this point to take the more challenging Wakhan Valley route, but hearing them talk of terrible sandy roads and rough climbs did sow a couple of seeds of doubt. We went through one final town, Alichur, where we arrived just after a big group of Mongol Rally cars. They’d raided the few small shops in town, so we were left with not much choice when we went in to buy whatever we could get our hands on. 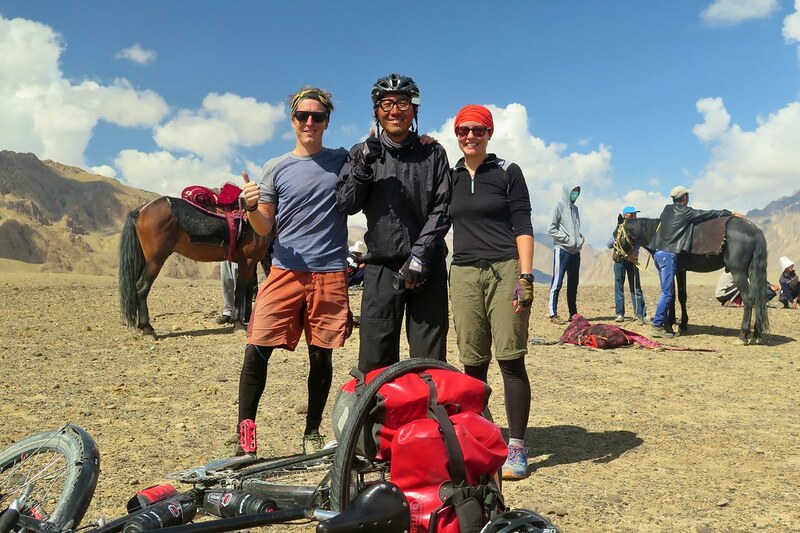 Leaving Alichur, we met a Kiwi couple, Rhys and Diana, who had just started their journal on CGOAB when we left Osh (https://www.crazyguyonabike.com/doc/?o=tS&doc_id=18142&v=QZ). We hadn’t been able to follow their progress as we didn’t have wifi for this stretch, but it was nice to run in to them. 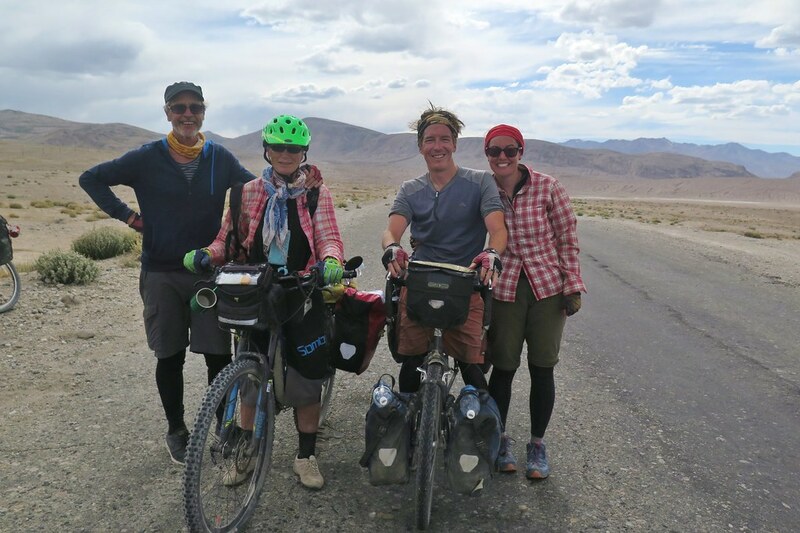 We chatted for a while with them and Kim who had also pulled over to say hi, before heading on and taking the turn off for the Wakhan Valley. Immediately the road surface deteriorated. We were straight on to a sandy road, climbing slowly away from the smooth M41. We’d already covered about 80km that day, so the sand really sapped what was left of our energy. 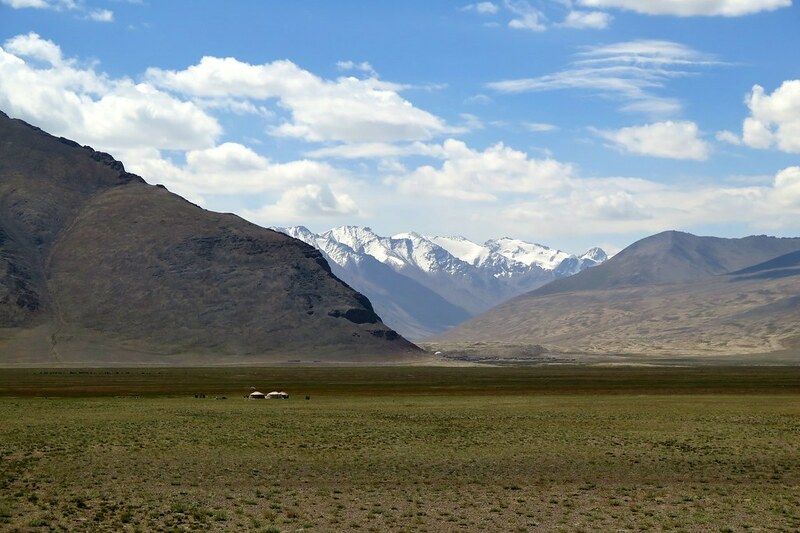 As with everywhere so far in the Pamirs, the scenery around us was just stunning, so we decided to call it for the day and pitch the tent. Just as we were about to leave the road, a motorbike came past and the rider waved enthusiastically at us. 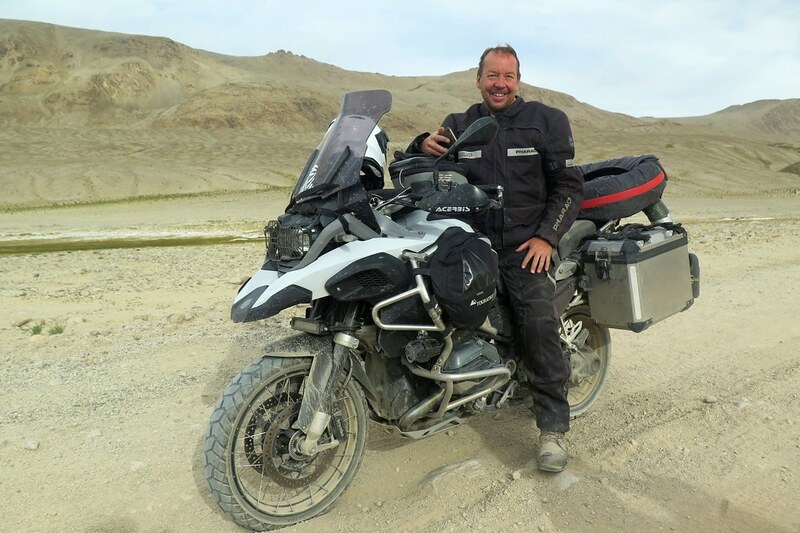 When he took off his helmet, we recognised him as Patric, a Swiss guy who we’d chatted to at breakfast the previous day in the hotel. 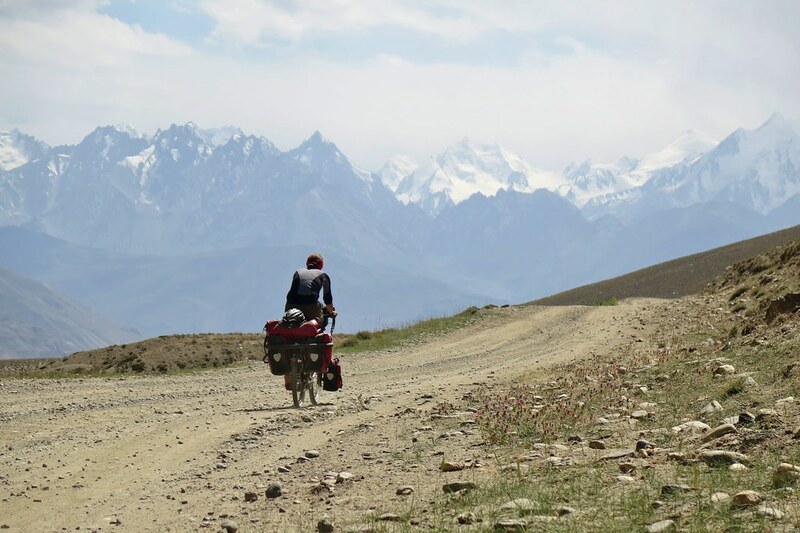 He’d been all the way to Khorog on the M41 and looped back through the Wakhan, covering around 800km in 2 days. It’s a bit quicker when you’ve got 800cc between your legs! He told us that there was a nice lake just ahead so we thought we might carry on to there to camp, until he checked and said it was another 6km away. Too far for us at the end of the day, so we put the tent up in a sheltered spot below the road. The climb started almost immediately the next morning. It wasn’t a constant up, but there were a series of short sharp inclines that came one after another. Some of them were on the very limit of what is rideable on a loaded bike, especially with the crappy surface. It was the last of the big passes, taking us up to 4,344m and the thinner air was really noticeable with the bursts of strenuous climbing. A few hours of slowly working our way uphill and we’d only covered about 15km, but we were within sight of the top. 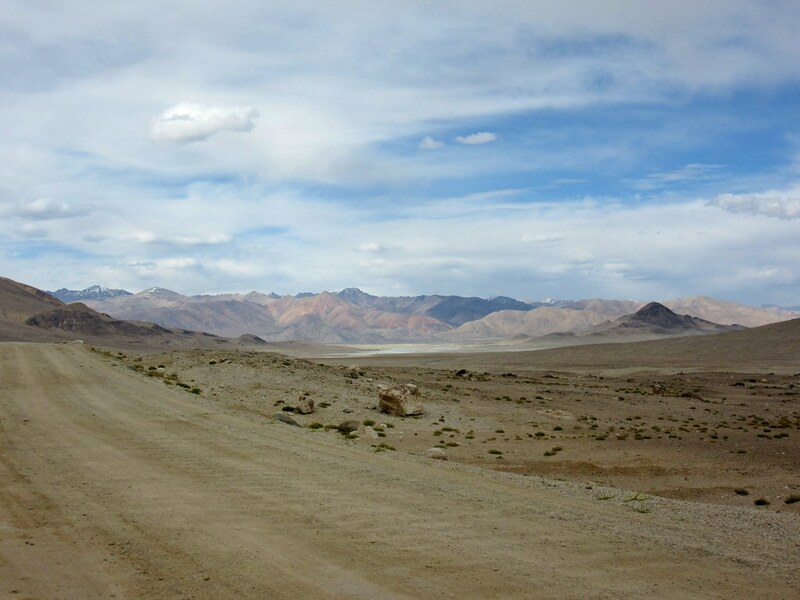 Again, there wasn’t a sign or anything to mark the pass, but we reached a point up on the high plateau where the road rolled over and started to descent past two salt lakes. 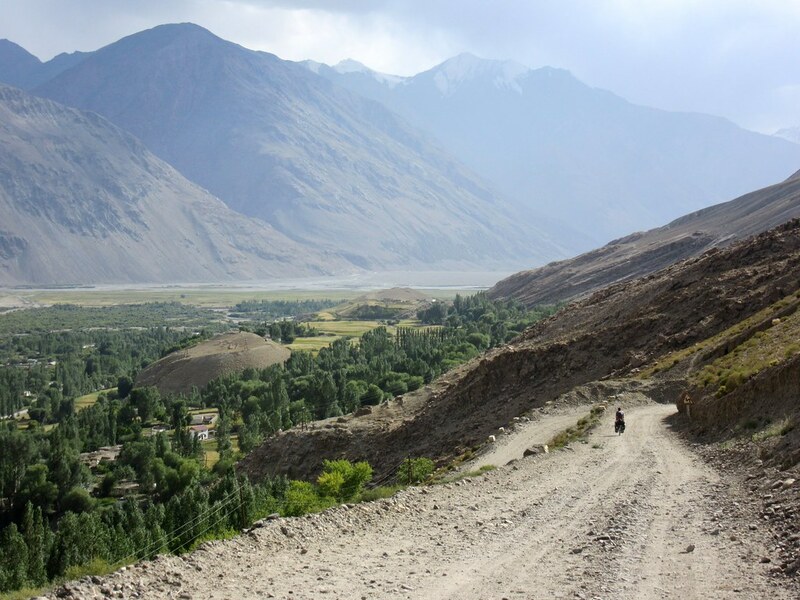 Below us was the Wakhan Valley and in the distance the mountains of Afghanistan and Pakistan. The downhill was quite gentle, but on a very rocky surface so it was a long slow descent with plenty of breaks to rest the arms. 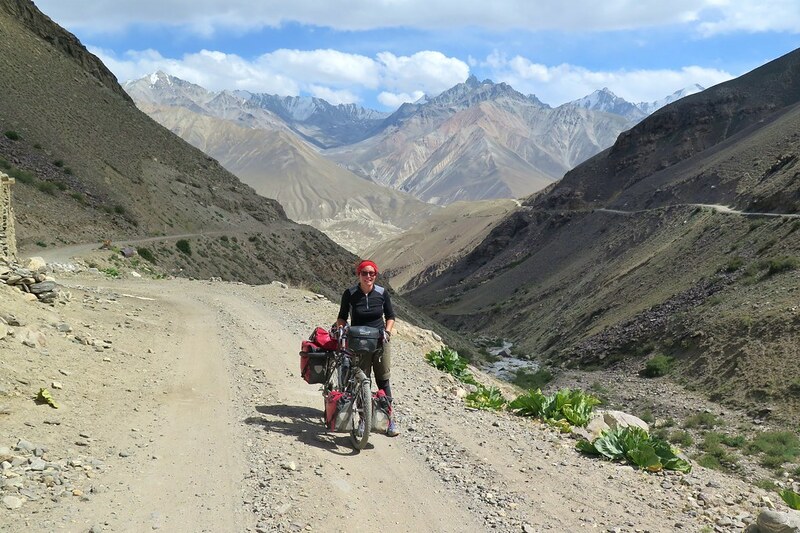 We passed a few more cyclists who told us that the road improved a great deal after Langar, the first town in the valley. One even said the surface was ‘perfect’ from there on. He may have been exaggerating. 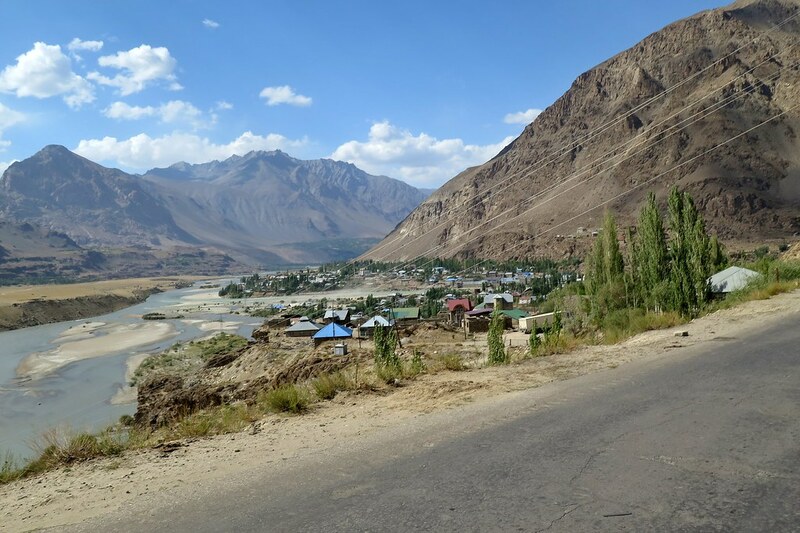 We reached the river Panj, which marks the Afghan border, passed another military checkpoint then turned West to follow the river down the valley. The wind really picked up through the afternoon, right in our faces so our progress was very slow. 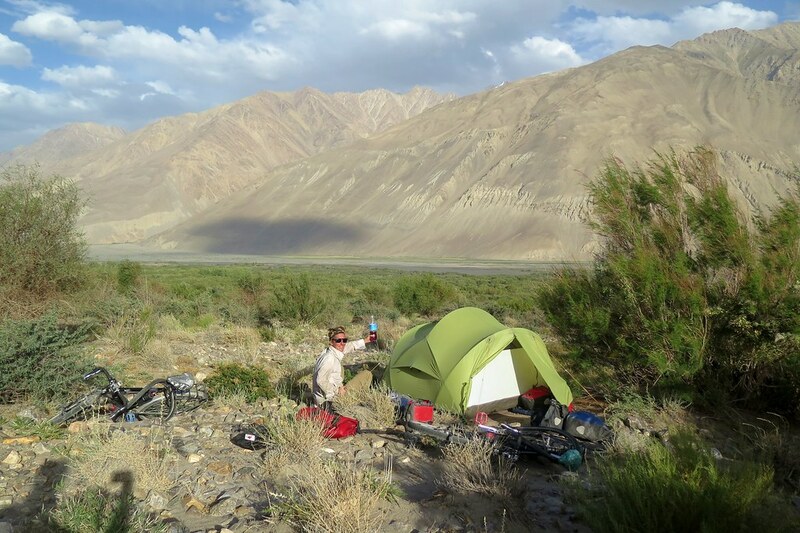 We covered a total of 40km then decided to get the tent up (tricky in the gusting wind) and have some dinner. Luckily the wind died down overnight and we slept well after a tough day. 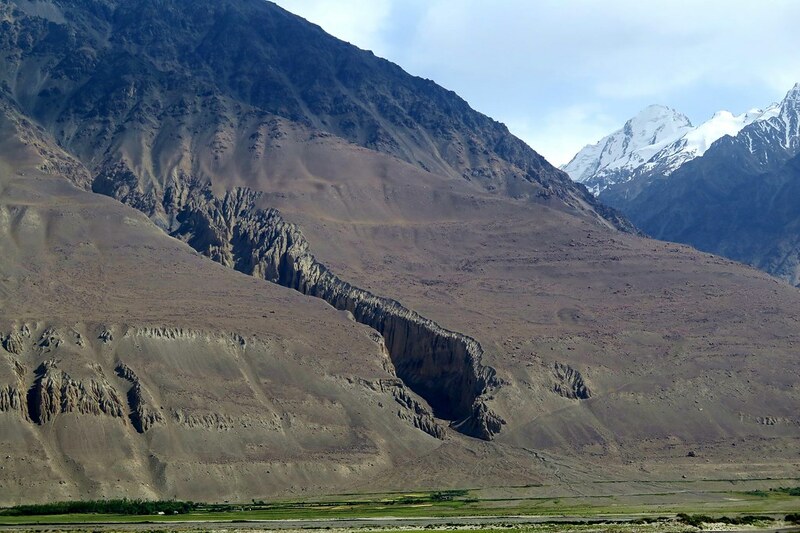 The valley narrowed the next day, at points the road was just a thin track cut into the rockface above the fast flowing Panj. 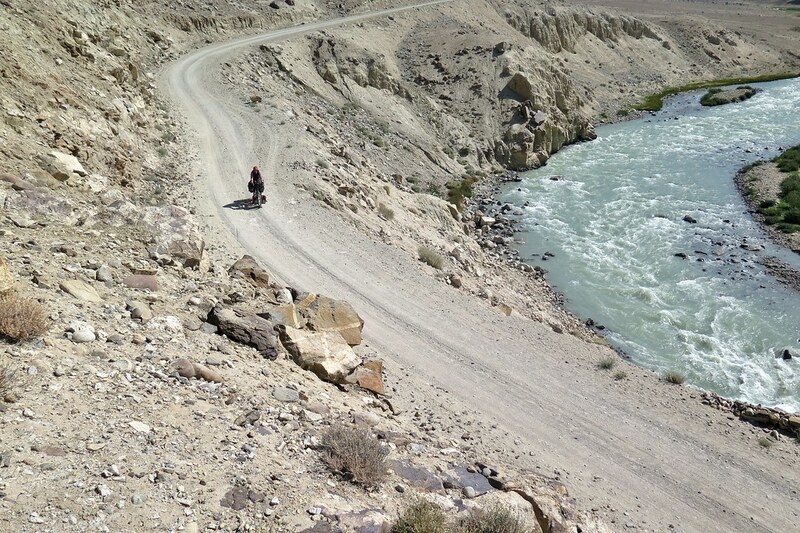 Despite travelling downstream, we were climbing through the morning, taking us further and further from the river below. 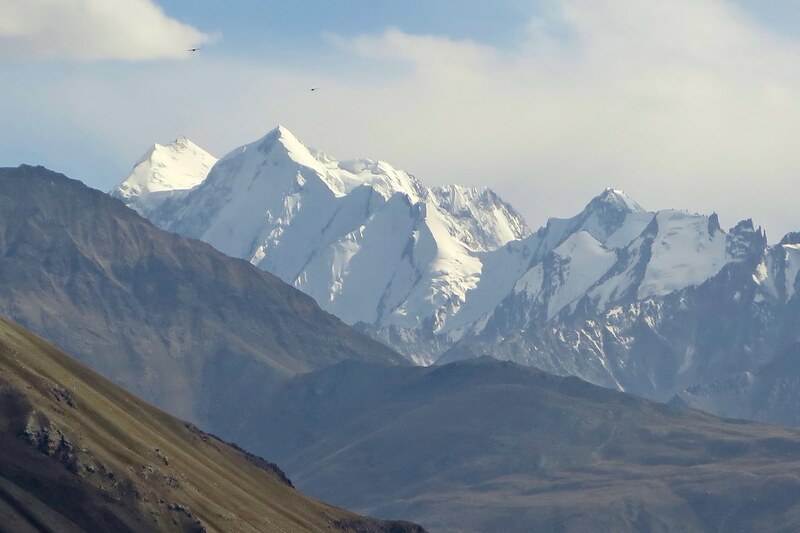 This gave us some incredible views to the South over the border and beyond into Pakistan, the 7,000m plus peaks of the Hindu Kush range towering above the closer Afghan mountains. I found it pretty difficult to take my eyes off the view, probably not that safe on a narrow rocky road above a big drop! Once we’d reached a high point, the road started to descend again, so we had a couple of hours of coasting and stopping regularly for photos. A final few sketchy switchbacks got us into Langar, an actual town with electricity and a shop or two. We decided to spend the night in a homestay where we had a much needed wash under a pipe in the garden then ate a good dinner. The roads were going to get smooth the next day, apparently, so all was good! Except the roads didn’t get better. 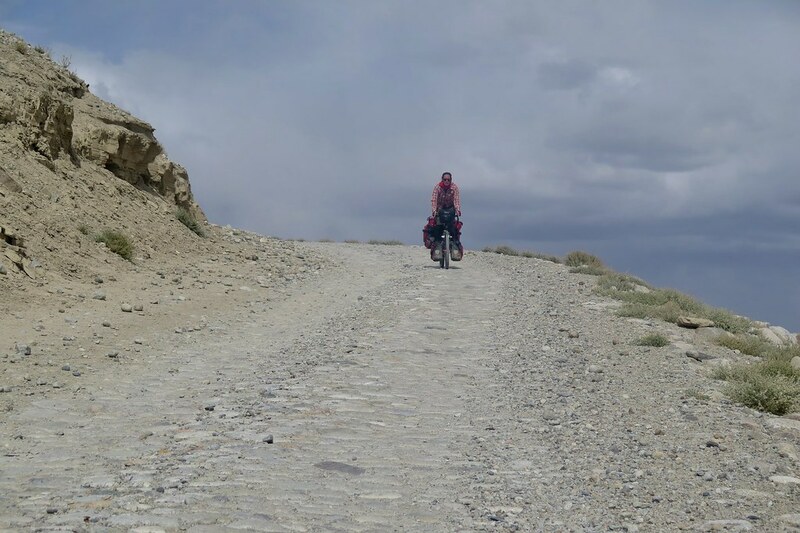 There was admittedly a bit of asphalt in the town, but leaving, we were back on to the same washboardy rocky surface that we’d been riding for the previous couple of days. 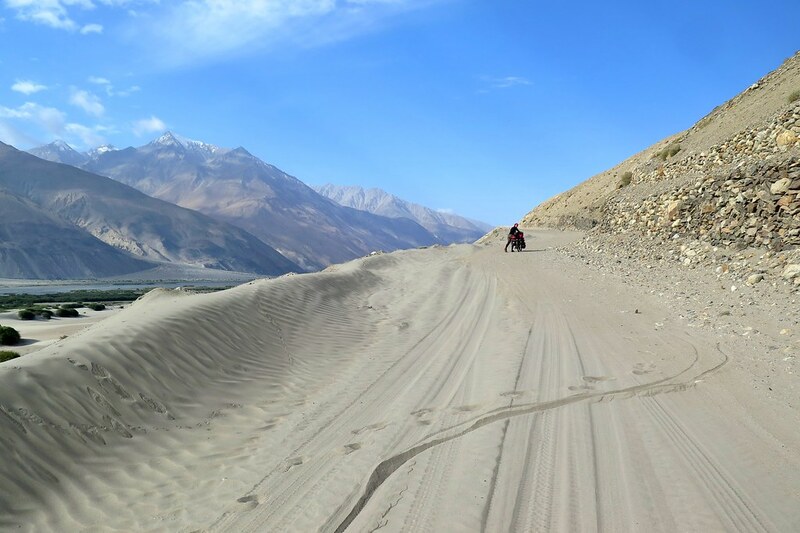 We were back down to the valley floor where there are sand dunes, which in places had blown right across the road leaving a deep sandy surface which was impossible to ride through. There were more frequent villages through this section of the valley, loads more kids waving and shouting hello to us as we pass. Also the welcome opportunity to grab a drink from a roadside shop now and again. The views between the villages continued to be amazing. 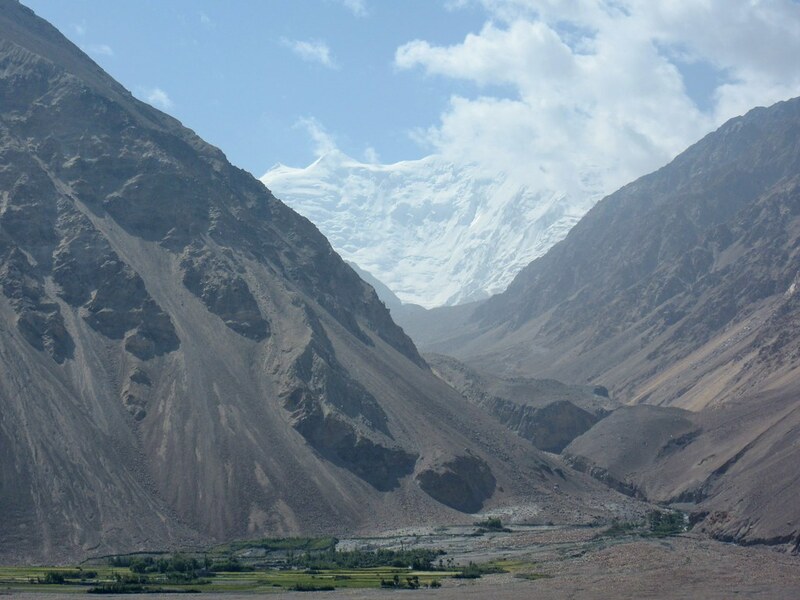 We were lower down so couldn’t see over the nearby mountains, but with every gap we could see through and to the glaciated peaks in Pakistan. 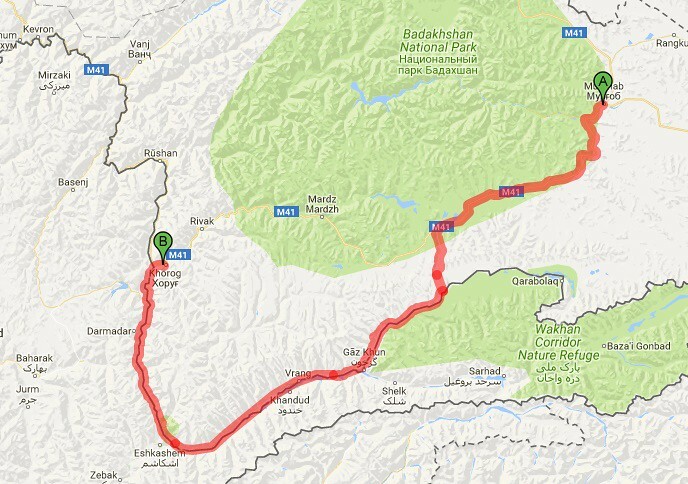 We had a couple of days riding down the valley and, to be fair, the roads did start to improve for the last 160km. 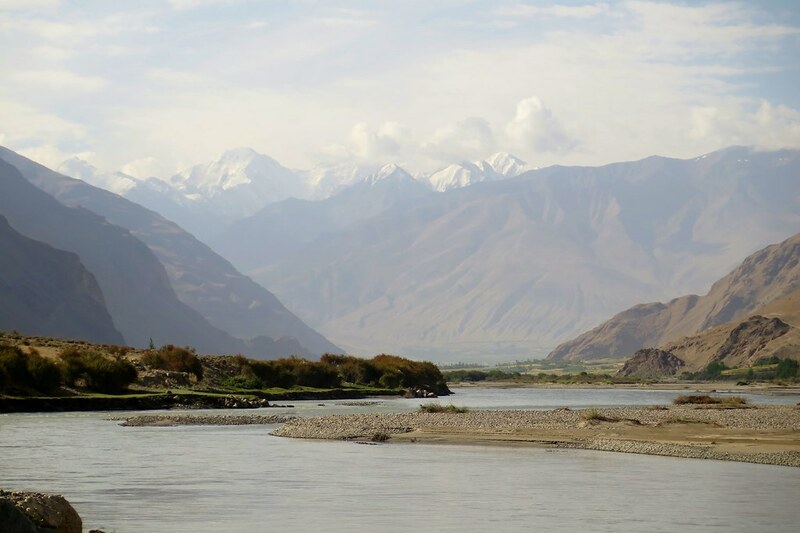 With it being mostly downhill, we were able to cover larger distances each day too with the target of Khorog within sight. It was easy finding places to camp, which were nice and comfortable thanks to the sand. Clean water was a bit more of an issue. The main river was very muddy and the smaller side streams mostly flowed through areas with animals grazing. We caught a couple of tiny worms when we put some water through a filter, which made us especially cautious of what we were drinking. We’ve heard of so many people getting sick in this area from the food or water, but (touch wood) so far we’ve been lucky. We also finished off each meal with a few generous sips of cognac which may have helped to kill any lingering germs! 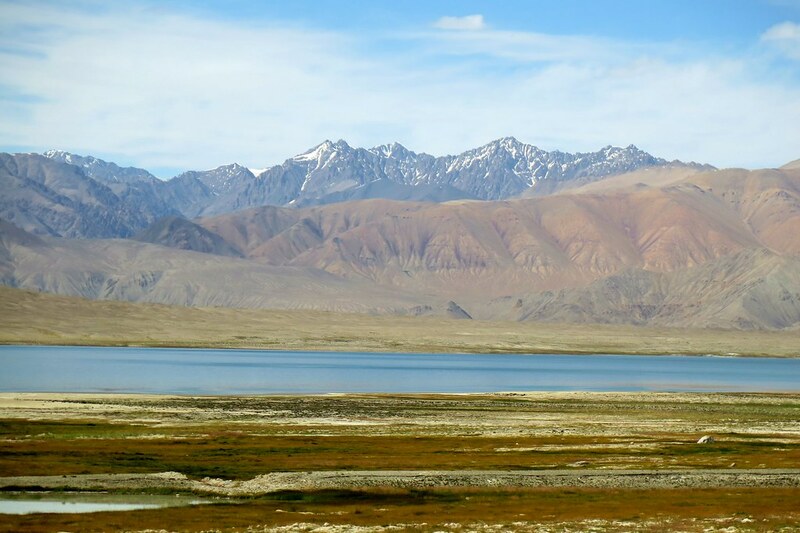 Soon after Ishkashim, the valley turns and heads north so the big mountains start to disappear behind us. 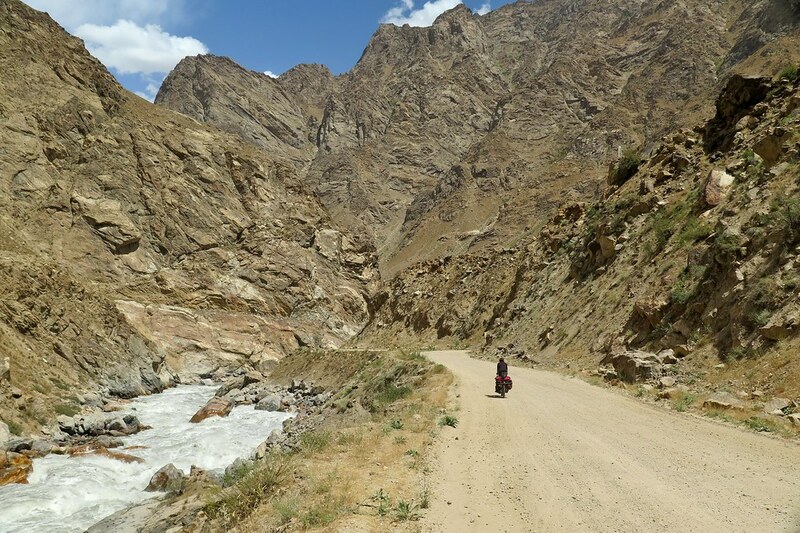 From here the road goes through a very tight gorge before we’re faced with one final steep climb to get us into Khorog. We’re a lot lower here than we’ve been for a while, and the temperature is noticeably warmer but the promise of a cold beer spurs us on. By mid afternoon, we round a corner and see the town spread out below us. We rode down in to the centre of town and found a nice little hotel with private rooms and bathrooms for a decent price. (Do Nazarbayg Hotel, would recommend it) By chance, Claire and Tim were staying in the same place. They’d taken the slightly shorter M41 route so had arrived the day before us. 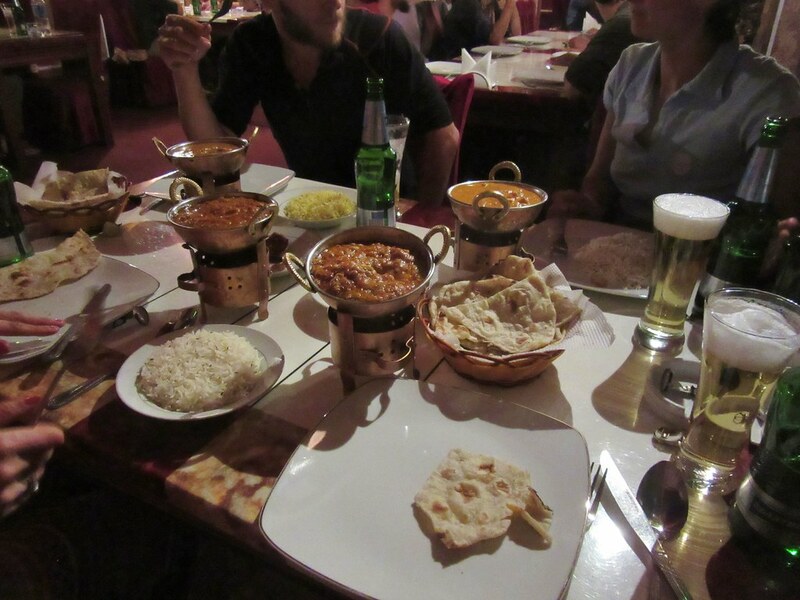 We had an amazing warm shower then headed out to the place all cyclists go to when they arrive in Khorog, the Delhi Darbar curry house. Well deserved after some tough days in the Wakhan Valley. Even though I’ve seen some of these photos (via Facebook), it’s incredible to see them again. Keep it up, guys! What fantastic views can only try to imagine what it must be like in real life. As always I Think you are both fantastic, there should be a class in the Olympics for endurance cycling you two would definitely win gold. 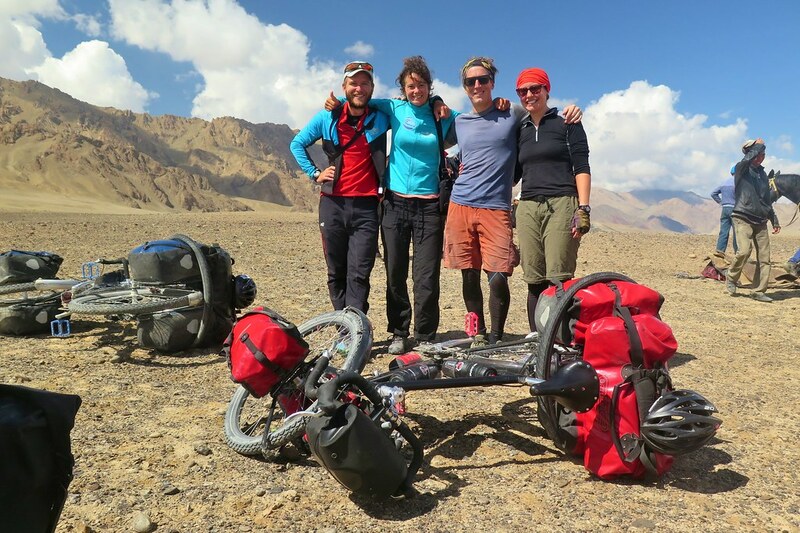 Lovely to read and remember that great route through the Wakhan!! 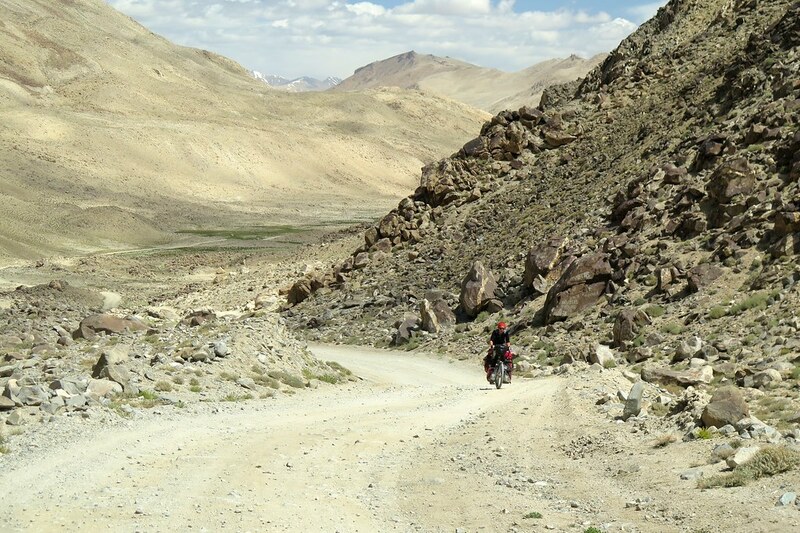 If ou’re in the mood for more tough riding but beautiful views then I reccomened the tougher route to Dush – over the pass!! The road is in crap condition because not many vehicles use it now there’s an alternative. I’m sure you’ll enjoy it!! Hi Gayle and John! Nice to hear from you! We’re already in Dushanbe, just behind on the blog post! Do you mean the northern route via Tavildara? That’s the way we went, and thoroughly enjoyed it. Amazing scenery, well worth the effort! We posted a few pics on our Facebook page, and will get round to a blog post soon!